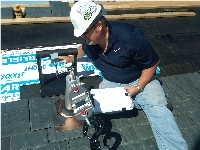 ﻿ Materials Testing - Material Testing - Construction Testing - Roof Anchor Testing - Paint Thickness Testing - General Testing in Illinois and Beyond - KAM Solutions, P.C. KAM Solutions, P.C. of Central Illinois offers a wide variety of building materials, material, construction and general testing. Visit our concrete and soil and aggregate testing pages for more information on these topics. We also specialize in many other testing fields. anchors should be re-inspected at least once a year, and re-certified at least once every ten years. KAM Solutions, PC, provides this testing and certification using the most recent OSHA (General Industry), OSHA (Construction) and ANSI / IWCA standards, found in 29 CFR 1910.66, 29 CFR 1926.502 and 1-14.1-2001, respectively. Our technicians load the anchors with forces oriented in specific directions, and measure resultant temporary and permanent anchor deflection, which provides a high level of safety and defensible results. Our staff of PEs and roof engineering experts travel throughout the Continental United States to provide the service - our location in Central Illinois is strategically placed to do so. 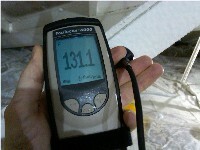 thickness on plaster, and measuring the underlying plaster thickness, to determine why recently applied paint was peeling for a building remodel. This project also included laboratory analysis of physical, chemical and moisture content characteristics of the plaster, pull-off tension measurement of the paint, and an investigation of the plaster and paint application procedures used during the remodel. Our field and laboratory technicians have capability of a wide array of testing, including the unusual and offbeat. Recent projects have brought us testing on a regional university track system. This synthetic track material was prematurely failing, and KAM Solutions identified the root cause of failure, by a combination of testing physical characteristics of the synthetic material, core drilling and testing the underlying soil for structural soundness, and by researching the original installation methods of the material. We also tested the material for environmentally unfriendly substances. We have tested building materials for quality, suitability and proper installation on other recent projects, to determine premature failure, or the cause of construction inadequacies. We can test many materials for hardness, toughness, tensile strength, compressive strength, shear strength, pH, moisture content, presence and amount or absence of a wide range of chemicals, and many other physical and chemical characteristics. If you have the device or material, we can likely test it.